On the surface, landscaping seems like an intimidating endeavor. If you take things one step at a time, however, it’s very possible to have fun and keep anxiety at bay while improving your yard. Digest these Landscaping 101 tips to set yourself up for success. Gardening is an art form, so get your creative juices flowing through brainstorming sessions. First, go all out by dreaming up your ultimate landscaping wish list. Don’t worry about practicalities for this step; the sky’s the limit. Generate as many ideas as you can muster. When you let your imagination run wild, you can begin to solidify your tastes. For instance, if you gravitate towards gardening ideas with a particular style or feel, keep these realizations in mind! Next, do some more realistic brainstorming by considering and evaluating possible priorities, goals, and needs that might determine your landscaping decision-making. There are fun landscaping priorities, such as outdoor entertaining, play, activities, and water features. Others are more practical. Architecture, seasons, functionality maintenance requirements, curb appeal, and privacy may be important factors to you. Controlling erosion, promoting efficiency and sustainability, conserving energy, limiting water use, and reducing fire risk are also important to some people when it comes to landscaping. Ask yourself questions in order to land on the most appropriate landscaping priorities for you: How do I use my yard now? What are my gardening strengths and limitations? Now that brainstorming sessions have exposed many landscaping possibilities and priorities, it’s time to be responsible and crunch the numbers before initiating a concrete plan. Productive landscaping plans must stick to realistic budgets. According to the American Society of Landscape Architects, a smart preliminary landscaping budget can be five percent to ten percent of your home’s worth. This number is partly based on the idea that great curb appeal can increase the worth of a home by as much as fifteen percent. Still, the most important thing is to name a budget that will work for you, based on your specific capacity and needs. To get the most value out of your landscaping plan, pay attention to every individual coast. Spend the most money on the most important changes, or the improvements that will get the most use. Ensure that you get return on your investment by asking yourself more questions: How long will I live in this home? How much will it cost to maintain this new yard? Can I afford to make many changes at once, or should I space them out over several years? With your preferences and budget in mind, it’s time to devise a landscaping plan. Complete a diagram by determining the dimensions of your plot of land, then committing the outline to paper. Fill in and make notes about existing features, topography, hydrozones, site lines and views, hazards and concerns, nuisances, soil type, and utility lines. It’s important to really analyze what you already have so you can work with it, instead of being at odds with it. Fill in the landscaping changes you’ve decided to implement. With plant selection and placement, consider areas’ exposure to sun and shade, sun and wind patterns, and possible focal points. Choose plant varieties based on their compatibility with the hardiness zone where you’re located. That way, you increase the chances that your new additions will grow and survive the winter. New structures, such as patios, decks, sheds, benches, fences, pools, ponds, and pathways, can also be substantial elements of landscaping plans. Take care that you comply with municipal zoning regulations and home association rules when digging and building structures. Apply for permits from local governing bodies if necessary. Action plans can be organized in stages, with durations as long as five years. Pace yourself. Start small, build step by step, and make adjustments based on results. Sit with your plan for a while before committing; your patience will be rewarded. In the meantime, annuals, groundcover, and mulch can improve your yard temporarily while you’re contemplating more permanent changes. Professional landscapers can help develop a new plan or offer feedback on your plan; they can also implement the improvements you request once a plan has been solidified. Find landscapers interested in helping you find middle ground between your dream yard and a realistic, practical design. You want someone who’s receptive to your ideas, goals, and schedule. Make sure that you can communicate with the professionals that you hire. Inquisitiveness is a sign that they are engaged. Find names and organizations through word of mouth and online directories. Skim portfolios, check for proof of licenses, certifications, and professional affiliations. Request that proposals be in writing and take the time to understand the terms and fees involved. Especially if cost is a concern, it’s wise to request estimates from at least three different landscapers. 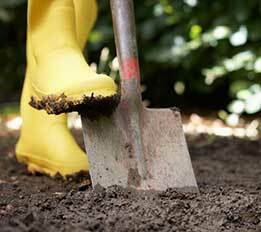 Fall is an ideal season to seek out a landscaper, if that timing works with your schedule. At that time, landscapers can take a look at your yard when plant life is mature. Then, there’s time to plan in the winter before planting season takes place in the spring.